I wish to share a most electrifying recent experience for the 4 0f us. On 7th January we were motoring in a travel agency SUV from Mysore to Coonoor ( hill station in South India) and we were in the region between Madhumalai and Bandipur (I guess I was around the 56th Km milestone). Around 4 pm as we turned a small curve on the road, right in front of us, on the main road, about 50 to 60 yards in front of us stood a huge elephant all alone with its mammoth tuskers facing us. The driver. Subbu saw him and brought the car to a halt. I was in the front seat with him (Hema and Vidyuth and Bhavani were in the back seats) and I could clearly see him. I was in fright. The elephant put a step forward and started to charge at the car with his tusks down. Subbu had the presence of mind and skillfully reversed the car in high speed. 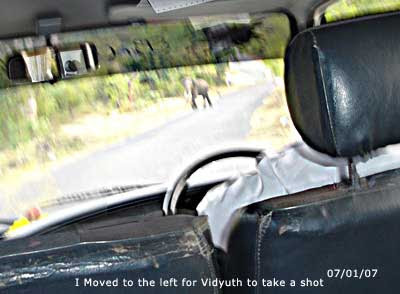 The “Yannai” ( Tamil for Elephant) must have covered about 20 yards in his charge and when he saw us backing off, he stopped and slowly moved off the road. We just talked about this in a low voice and waited. The elephant partially hid himself in the dense bamboos but I could see his tusks and he was waiting for our next move. In another few seconds he had disappeared. Vidyuth, my son, had a shot of him whilst in the car and that’s the only picture we got. All the way we discussed the event. The driver who was making regular trips in this area said he never ever experienced a ‘charge’. He felt that had he delayed the reversal, the car would have been turned over. We all agreed. He have never known how fast an elephant can “dash”. I don’t believe he was a rogue as otherwise we would have heard about this. I believe he was with a smallish herd and he was unwell or slightly injured and was not able to keep up with them. Seeing a big SUV moving towards him left him no options ---- well this is just my theory.